The LGBT Bar Association of Wisconsin is an association of gay, lesbian, bisexual and transgender legal professionals and their allies. Learn more about who we are and what we do in the About Us section. Come out to Meet the Bar! U.S. District Judge William Conley found that Wisconsin's rule prohibiting Medicaid from paying for gender confirmation surgery violates both the Affordable Care Act and the equal protection rights of transgender Medicaid recipients. It's so easy, just click here. Thanks to all who came out in support of an amazing event. We hope to put on more presentations like this one with other affinity bar groups, again soon! Stay tuned. LGBT BAR MEMBERS MAKE HEADLINES! Leslie Gutierrez, previously of Whyte HirschBoeck Dudek, now Husch Blackwell, was featured in July 2017 Wisconsin Law Journal for her outstanding legal service. 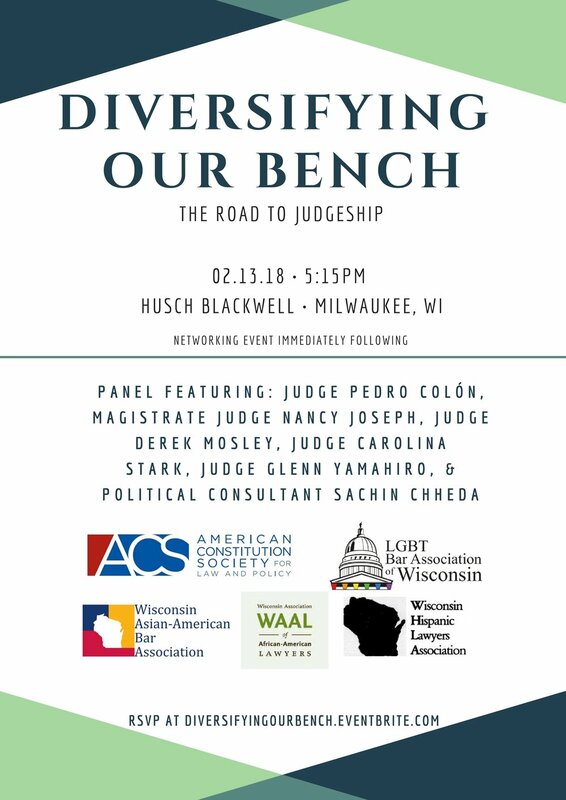 Register for free with Wisconsin Law Journal and read more about this amazing attorney, fellow LGBT Bar Member, & Director, here. Congratulations to Ruth Irvings, Wisconsin Law Journal 2016 Woman of the Year!!! Irvings heads Law Journal’s outstanding Women in the Law class. Watch the video below. LGBT BAR FOUNDING BOARD MEMBERS at our 2nd anniversary. (Can you believe the Bar is now 3 years old?! : (From Left to Right) Kate Westfall, Bob Held, Morgan Tilleman, Danielle Bailey, Taylor Barnes, & Lauren Schuster. KNOW YOUR LGBT RIGHTS CARDS ARE HERE! Creating Diverse and Inclusive Environments in Law Firms By Jacquie Champagne. Want to help the Bar grow? Want to contribute in other ways? Have an idea for an event or CLE you would like the Bar to host? Want to volunteer? Contact us.